If you're looking for a lot of terrain, a lot of choices, plenty of places to eat lunch and runs, runs runs, then take a look at this Heavenly Valley trail map. You will see how massive the mountain is. There are two main base lodges at Heavenly Valley, the California Side and the Nevada side. The Nevada side is the more developed side with the famous Heavenly gondola taking you right into downtown. 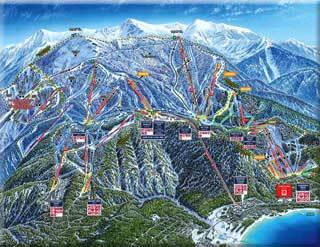 While most people want to be near downtown for their Apres ski and dinner, the California side is more local oriented and near a whole lot more housing and lodging, making the "walk to lifts" so much shorter. You can find lots of lodging in our reservations area too! When you come to Heavenly Valley, it will take no less than 3 days to do the whole mountain, and do it right. You'll want to focus on one side and then slowly migrate across the mountain to the other. There are shuttles to also help you get around South Lake Tahoe, so if you do end up on the wrong side, no worries, you can always get back to where you started!